This case study details work presented as a final project for Stanford University's Graduate School of Business "Designing Happiness" class (MKTG555) with Professor Jennifer Aaker. Use scientific research on happiness to transform a terrible customer experience (e.g. airport baggage claim) into a great one. Our team focused on using micro-interventions to radically improve the museum experience at Stanford's own Cantor Arts Center. The team’s first step was to spend an afternoon observing and documenting the chronology of a visitor experience. We also gathered a number of stories from various stakeholders. These stories gave us insights into the different ways in which people participate in the museum ecosystem, their motivations for engaging and current obstacles. By qualifying and visualizing human interactions at all levels of the museum, we came to a not-so-startling conclusion: The Cantor's organizational structure did little to actively foster an experience beyond the quiet contemplation we've come to expect from a museum. Through several ad hoc interviews with guests and staff, we discovered that many visitors came to museums simply because they felt they "should." Although certainly able to appreciate the artwork, folks often left wanting to know more about the works and "why" it was important enough to be shown at a museum. This should come as no surprise. Most museums put myriad barriers (both physical and psychological) between the viewer and the viewed, often out of necessity. Art is frequently locked in a transparent acrylic box mounted on a pedestal. The only information we're given comes in the form of a small placard, aptly called a "tombstone" that presents a few lines of predominately biographical information about the object and/or artist. In our conversations with guests, one thing kept coming up: "I wish I knew the artist's own story behind the object." The staff, who possess immense subject and cultural knowledge, had scant opportunity (or historical precedence) to share this information directly with visitors. Consequently, all the knowledge and enthusiasm remains behind glass, on a pedestal. Meanwhile, the museum staff want to share their passion for these objects. Our mission at this point became clear. We needed to re-align the staff's mentality and, to some degree, organizational structure to bridge the gap between visitor and curator. We needed a shift from exhibition to engagement. We proposed re-framing the Cantor's role as one of creating a magical visitor experience using artwork as a vector. The underlying mindset influences everything from how the museum staff perform their work, what they collect, how funds are used, and even brochure font choice. The team used the stories we gathered during our visit to inspire and inform possible interventions, each mapped to a specific area of happiness research. The first person we encountered was Hillary, who greets visitors as they enter. Since the Cantor is free to all visitors, Hillary’s main role is to orient people and help them navigate the museum. She also directs backpack-wearing visitors such as ourselves to store our bags in museum-provided lockers. A visitor's first direct human contact at the museum, Hillary’s role is a vital and overlooked one. Research shows that anticipation plays a vital role in our happiness and can be even more enjoyable than the experience itself! In addition to making suggestions to give visitors a jumping off point, she can "prime" them with questions such as, “What are you excited to see today?” This simple question orients the visitor's mind toward excitement and discovery. 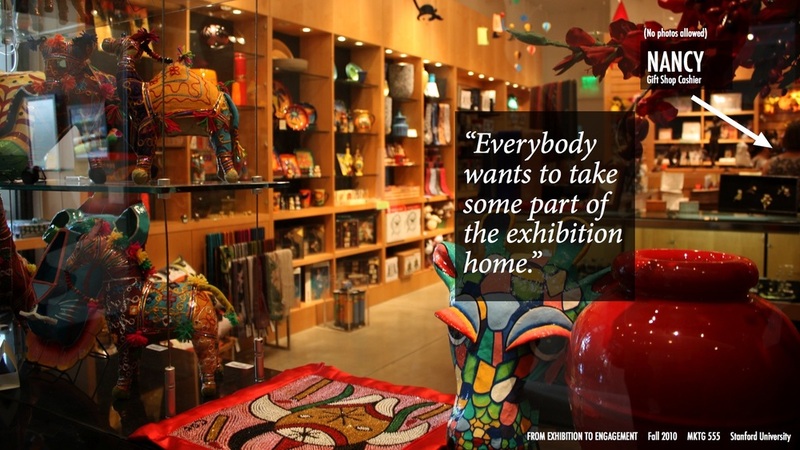 Visitor motivations varies greatly, even within such a specific institutions as museums. While wandering through the galleries, we happened upon Cantor regulars, Daphne and her son. Daphne described the museum as a place where her son enjoyed playing. Although somewhat unexpected, this demonstrated research that details how our definition of happiness changes over time: While children find happiness in simple, active things, as we get older, we find increasing satisfaction in calmer, reflective activities. As we thought about designing for visitor happiness, we brainstormed different ideas for different ages. For example, educational experiences through play are great for children, whereas young adults enjoy social events and older adults might enjoy having a meditation session in the museum's quiet, light-filled spaces. The next stakeholder was La Trish, the head security guard. She communicated to us the joy she finds in connecting with the visitors. This was an important reminder that literally everyone in the museum has a direct impact on visitor experience and that your best ambassadors may be wearing an unexpected uniform. Clearly, employee motivation needs to be better understood in order to deliver a truly great visitor experience. 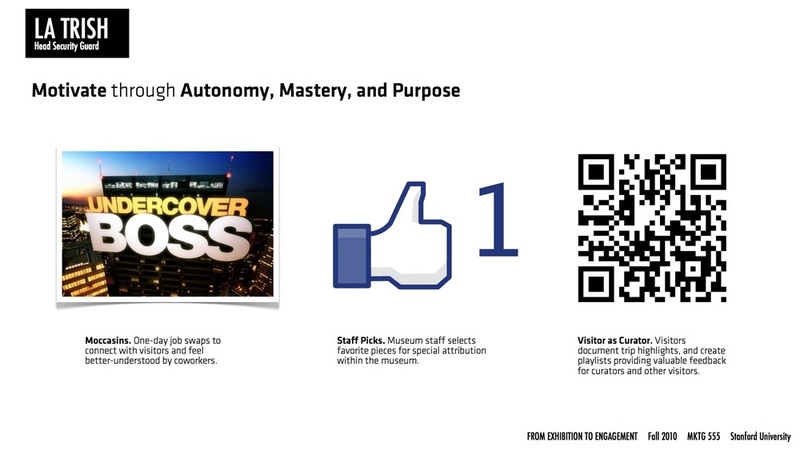 We knew from our class research that Autonomy, Mastery and Purpose are critical components of employee satisfaction. In what ways might we imbue museum jobs with these elements to let employees thrive? Our ideas were as simple as having staff being able to denote their favorite pieces of artwork to visitors, or having one-day job swaps amongst employees to help them better understand where their role fits in the larger museum ecosystem. Note: Mobile Technology and the Museum Experience became the focus of my thesis work. We also ran into a curator Bernard, and an alumnus who was in the process of donating a piece of artwork. This was a part of the experience we had totally overlooked and a great reminder of the greater systems at play in all human organizations. The donation process highlights another component of happiness: the feelings of contentment associated with prosocial behavior such as donating one’s time or resources. Clearly, the museum can drive happy experiences through facilitating prosocial behavior. For example, many museum visitors are incredibly knowledgeable about art and art history, or at the very least are interested in having deep discussions about the artwork. Why not have the museum facilitate impromptu meetups to allow visitors to share their knowledge and interests with one other? As we continued to wander the galleries on that sunny day, we realized how empty they were becoming. Where had everyone gone? Upon hearing the grumblings of our own stomachs, it didn’t take us long to find out. Even though visitors felt sheepish about coming to an art museum only to end up in the cafe, food plays an important role in happiness! Who hasn’t felt revitalized after a bite to eat? The Cantor might drive happiness by bringing the museum into the café, making a more seamless experience. While you can’t bring food into the exhibition halls (a rule we eventually discovered upon having our prototype intervention of a cookie platter banned from the welcome desk) perhaps we could bring the spirit of the exhibition into the dining area? Theme-based menu items seemed a likely candidate. For example, taking a break from a French Impressionist exhibition affords you the chance to mull over your experience while enjoying a nice baguette sandwich and glass of wine. Our memory is far from perfect. In fact, our memories of an experience and how we felt at the time can be very, very different. It makes perfect sense that we want some totem to mark our experiences and aid our memory: The french word "souvenir" literally means "to remember." Researchers have shown that our first impressions and final moments exert the greatest influence on our memory of an experience. Designer's should, therefore, take advantage of this positive memory bias and pay special attention to these times. While the Cantor has little control over the terrible parking situation on-campus, they can incorporate creative final moments like a personalized visit book or gifts for frequent visitors. Despite being an academic exercise, this work laid significant groundwork for my masters thesis with teammate Laura Martini. Our thesis proposed new ways of leveraging near-ubiquitous mobile technology to drive engagement and revenues in museums, while creating an organizational culture of visitor focus and experimentation. We even had the honor of presenting our thesis findings to Cantor's amazing Director's Advisory Board which also became the inspiration behind a new Stanford d.School initiative, ReDesigning Theater Projectwith Carole Shorenstein Hays. From Exhibition to Engagement was a collaboration with Laura Martini and Eric Grossman. Link. Published on September 04, 2012 by Michael Turri.